A partnership between Parking Australia and Physio-Control, to promote the use of AEDs (Automated External Defibrillators) in car parks, has funded a $1000 donation to Safer Australian Roads and Highways (SARAH). Guy Leech, official ambassador for Physio Control, presented the cheque to SARAH’s President, Peter Frazer at the recent Sydney Insight Forum. As part of Parking Australia’s agreement with Physio-Control for every defibrillator sold, Physio-Control donates $100 to the Good Will Club, Parking Australia’s forum for charitable fundraising. 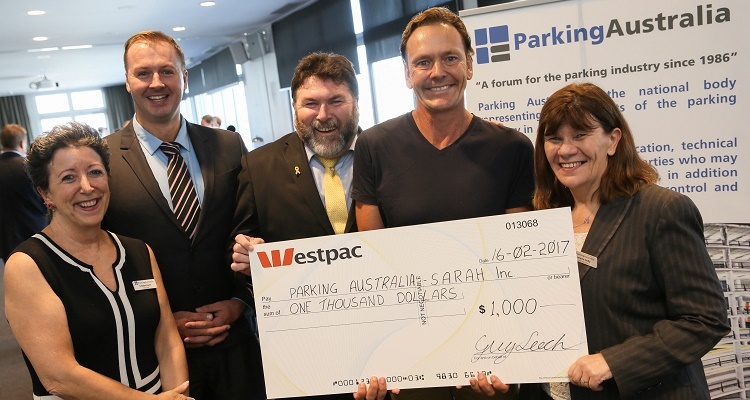 The Parking Australia Charity of Choice for 2017 is Safer Australian Roads and Highways (SARAH). SARAH is a not-for-profit association who promote initiatives that will bring about improved road safety, as well as support those affected by road tragedy. SARAH is committed to fostering improved road safety and awareness through education campaigns and initiatives. SARAH invites drivers to take a pledge to drive so that others survive – visit the SARAH website to find out more. Research from Take Heart Australia states that approximately 30,000 people suffer a cardiac arrest outside of hospital and are treated by emergency medical services each year. On average only 9% of sudden cardiac arrest victims survive in Australia. Early defibrillation is the single most effective treatment. Pictured (left to right): Cristina Lynn, Craig Spence (Physio-Control), Peter Frazer (SARAH), Guy Leech and Lorraine Duffy.